Debut novel...first book in the WILD series! No smooth-talking man is going to outwit her! With the deed to her land and kid brother to protect, Mustanger Skylar Daines shouldn't have tangled with the likes of Tucker Morgan. His stolen kiss scatters her senses, and quicker than a whirling dust devil, they're wed! What had started as a joke is now Tucker's worst nightmare. 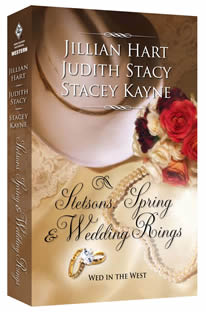 He's keen to fix the marital slip-up--then he tells Skylar the deed she holds belongs to him, and him alone. Perhaps Skylar shouldn't be so fast to have their marriage annulled. She's not about to be swindled out of the one thing she yearns for most--a home. First they'll have to beat her father's murderer to Wyoming. 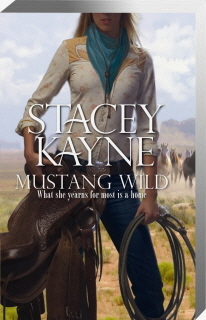 Hearing the killer is after his ranch, Tucker teams up with a woman who has no trouble taking control of his mustangs--or his desire. Second book in the WILD series! Cora Mae Tindale isn’t looking to stir up trouble—she just needs a safe place to hide while she plans out her future. Having escaped the marriage trap set by her conniving mother, she’s arrived in the wilds of Wyoming searching for the stepbrother who promised to always protect her. She hadn’t counted on the boy from her childhood becoming a war-hardened rancher with heart-stopping looks that could tempt a saint. Plagued by horse thieves and marriage-minded females, the last thing Chance Morgan needs is a woman on his ranch. But Cora Mae is more than just a pretty face—she’s part of his past; a reminder of the guilt and broken promises he’s spent too many years trying to forget. A distracting array of curls and curves, she hardly resembles the mischievous spitfire from his youth, but her eyes hold the shadows of a painful past, and a passion she struggles to conceal. Cora Mae’s indifference entices Chance in a way that blatant flirtation never could. He yearns to discover the truth she hides, but will uncovering her secrets expose his own? Third book in the WILD series! In the midst of a range war, Garret Daines is dead-set on keeping his ranch from greedy local cattle barons. An attempt on his life during a winter storm lands him in the healing hands of a mountain recluse. He can hardly believe the youthful beauty he discovers hidden beneath her mountain woman attire or the passion unleashed by her tender touch. When "Mad Mag" pulls the handsome rancher from the snow she has no idea he'll be the man to thaw her wounded heart. But Maggie is hiding a mess of secrets in her mountain sanctuary, none of which she’s willing to share. Murderous cattlemen threaten their fragile bond and Maggie has to face the fears of her past or risk losing her hope for the future. Garret will defend his wild woman at any cost, but can he convince her their love is worth the risk? No matter what he believes about the saloon girl's past---he'll protect her future with his life! Pulled off a train in Nevada by the henchmen sent to drag her back to Missouri and the Nightingale Saloon, Rachell prays for deliverance. A stranger appears from the shadows and frees her from her captors. Once in the care of her reluctant hero, Rachell wonders if she is any safer in the arms of a man whose eyes make her pulse quicken and gentle hands dare her to believe in the fable of love. Jed knows he's in for trouble when the widowed boarding house keeper he's come to retrieve turns out to be a scantily-clad saloon girl. 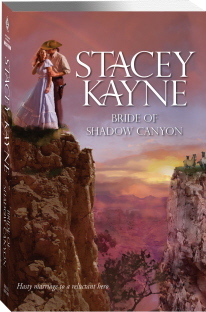 He vows to protect Rachell and get her safely to California, after he takes care of the trouble on her tail by luring them to Shadow Canyon. As they face the feral wilderness of Utah and the man determined to keep Rachell’s voice in his saloon, it is Rachell's innocent passion that becomes Jed's greatest threat, threatening to bring the light of love into his shadowed soul. She vows to kill him....he'll risk everything to protect her! Lily Carrington sees the name of an infamous killer on the payroll of her new lumber company and leaves her cushy San Francisco office to journey into the untamed wilderness and avenge her father’s death. Unprepared for the turmoil of a lumber camp torn apart by financial strain, Lily finds herself at the mercy of lumberjacks willing to do anything to get their pay. A handsome stranger determined to keep the peace becomes her sole protector—the very man she’s sworn to kill. Juniper Barns has sought out a secluded life to escape the ghosts of his past, men seeking revenge for those he'd killed during his youth as a gunfighter. Realizing his new pretty boss has come with vengeful intentions, Juniper knows his troubles have just begun. As they work together to bring the lumber camp under control, their mutual desire becomes a new threat. Can they overcome a past built on vengeance to find love in their future? Searching for solitude…and finding love.